I decided to group the restaurants based on SWEET options. This includes CANDY STORES and BBQ. the BBQ and Blues fest, which featured BBQ from all over Louisiana. I never realized NOLA was known for its pralines and candies as much as their cajun cuisine. After bypassing several of the larger establishments, I found Leah's Pralines. This small, family-run shop is located off the main streets but is home to wonderful candies. Their pralines were just OK in my mind, but their Bacon Pecan Brittle was to die for. Large chunks of candied bacon and halved pecans are encountered on each bite of this brittle. You may wonder why I could only give it at 3.5 mile rating... well when you shell out more than $10 for a small bag of brittle, you make think twice about coming back. Yes, I do crave it, but I can suppress that craving to save some cash. As previously mentioned above, dozens of candy stores line the streets of NOLA. When it came to toffees, I only came to Southern Candymakers. Here, they make several versions of the classic english toffee candies. Some topped with milk chocolate and walnuts, while others had white chocolate and pistachios. A dark chocolate and pecan option was also available. These are extremely sweet and the toffee has the perfect crunch to allow it to stuck to your teeth, but melt away. Super buttery and rich, make sure you only eat half at a time. I tried toffee elsewhere, but it didn't match up. Unfortunately, at two to three bucks a piece, the prices add up fast. 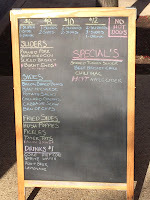 At the BBQ and Blues fest, I was able to sample several different restaurants and their championship-style BBQ. After pacing back and forth several times, I finally chose Walker's Southern Style BBQ as part of my meal. Here, I ordered their FAMOUS Cochon de Lait Po' Boy. This coveted sandwich used to only be available at the blues fest; however, after by popular demand, a store front was finally opened. This po' boy starts with the typical hoagie roll then a thin layer of slaw before literally two handfuls of their pulled smoke pork. It literally weighs more than a pound. The meat is plentiful and has some of the best smoke flavor I have ever tasted. The slaw is just enough to cut that smoke and give it a vinegary crunch. I wish I had time to get another one, but with so many options I decided to diversify. I crave this po' boy more than any po' boy in NOLA and for that reason I decided a 4.5 mile rating was easily worth it. This sandwich almost tipped the scales to perfection. The other stand at the Blues and BBQ fest I decided to try was Squeal BBQ. I saw the actual restaurant near Jacquimo's in Uptown, but wasn't able to try it due to lack of a car. Luckily for me, they had a stand. They offered two dishes... the first was pulled pork polenta and the second was the NOLA classic, boudin balls. When it came to the polenta, I loved the creaminess and the amount. They were very generous with both meat and polenta. Unfortunately, I didn't really see how the two ingredients mixed... in fact, I found so much disconnect, I decided to eat them separately. The polenta had no smokiness or BBQ aspect at all. And the pulled pork just sat on top of the polenta. Eating them together didn't even help. Now the boudin balls, these were the best I had while visiting NOLA. I know that isn't saying much since I only found two places that offered them, but still I was glad to have them. Boudin balls are their rice and "left over" pork sausages rolled into a ball before being deep fried and served with some kind of mustard dip. The sausage itself is a little strong for many, but when it is deep fried, it loses that game flavor. The blues fest was a beautifully orchestrated in one of the squares near the central business district. Despite the rain, there was still a huge turnout. Tons of BBQ smells filled the air making me want to come back for more. One of my "go-to" bars is Simone's. This bar is located in the Pilsen neighborhood making it one of the better options around UIC. When you arrive, you will notice the bar uses old pinball machines as shelves and other decoration. They have swinging chair seats as their booths and other interesting trinkets. After you take in all their weird decorations, you realize they have an extensive craft beer list and a rotating list of mixology cocktails. I also really enjoy this bar because of the specials they offer. As a student, it is amazing to finding a place that offers a burger and beer for five bucks or pizza and beer for six. Unfortunately, the area is not as nice as the River North neighborhood and not even close to that mainstream crowd. This is a place to come for a chill night or a quick dinner. Don't get me wrong, the bar does get packed, just not like the downtown joints. After trying a bunch of their food (sorry only pizzas described below), I can safely say they are above average and for that reason, I gave them a 4-mile rating. It was a no brainer choosing the $6 any pizza special with PBR tall boy. The hard decision was which pizzas to choose. For the first, we stuck with "The Pilsen." This pizza has a thin crust base and rather than a tomato sauce, it uses a black bean emulsion for its sauce. Then, the pizza is topped with your typical taco ingredients... pico de gallo, mexican cheeses, and ground beef. A few tortilla chips top the pizza. After the first bite, I realized this was a weak attempt at CPK's tostada pizza, just lacking the lettuce. The pizza itself was extremely salty. So how to make it better? Add shredded lettuce, chopped onions, and less salt. Then it would be stellar. The second pizza was their bar's speciality. The "Simone's Pizza" was built on the same crust, but was a white or sauceless pizza. Instead, it was topped with sliced red potatoes, parmesan cheese, and a rosemary simple syrup. This pizza was absolutely delicious. The potatoes were soft, but not overcooked. The parmesan cheese added the needed sharp flavor and that rosemary simple syrup reminded you of the holidays. I wish they added honey or a little more of the simple syrup to give it a sweet and salty profile. I highly suggest this pizza and will be back to get it again! - Huge variety of cocktails. They are strong drinks and use ingredients from jalapeños to egg whites. You really can't go wrong if you like strong, mixology-type cocktails. - Call ahead for their daily special. We had the Any Pizza and a PBR Tallboy for $6 total. Other specials I have stumbled across includes Burger and PBR for $5 and Free Fries with any drink purchase. - Walking around the area at night is not the safest. One of my friends even had a her car broken in to, so don't leave anything in plain sight. A lot of my friends kept asking me my thoughts on Mercadito. And, I was always against having EXPENSIVE Mexican food, especially with the Pilsen neighborhood so close. Anyway, one of my friends and I headed to Mercadito after a night of skating. On a random Monday night, the restaurant was crowded. In terms of the atmosphere, think modern design, yet packed in tight. Our tables were essentially on top one another, making it easy to eavesdrop if that is your forte. And, with such a busy restaurant, the service didn't keep up to par. When it came to the food, I was impressed with the guacamole and all the tacos we ordered. In fact, these were extremely authentic and at the same time, unique enough to make me want more. They offer specials, which for us, included an Asian-inspired duck taco. But once again, price was the deciding factor keeping it from a higher rating. At $16 for an order of 4 tacos and $13 for the guacamole duo, you can just imagine how fast a final bill can add up. And for that reason, the 4-mile rating is fair. Great food, but River North prices. If they allowed a mix and match for tacos, I would feel more comfortable paying those prices. I had heard great reviews about Mercadito's guacamole, mainly because of the many different choices. Ordering just one is a rip off, so we stuck with the guacamole duo for just a few bucks more. Our first guac was the tocino. Imagine bacon, roasted sweet potato, tomatillo pico, serrano peppers, and topped with fried sweet potatoes... can't go wrong! The other guac was called pera. This one had pears, chipotle meco epazote, and pico all mixed in. The tocino guac had a nice bacon flavor to it, which made it extremely savory. The sweet potatoes didn't add much except for a crunch factor on top. The pera guac had a nice sweetness to it, but not enough spice. They were both delicious, but a little something extra on both is needed to elevate it to the next level. Highly recommended, but not even close to extraordinary. For our first set of tacos, we stuck with camarones aka shrimp. Each order comes with 4 tacos of the same type, NO MIXING. These tacos had shrimp sauteed in a roasted garlic and chipotle mojo sauce before being topped with a slice of avocado. They were served on a lightly warmed corn tortilla. Each taco was packed with shrimp... in fact, the shrimp would fall out on each bite with how overloaded each one was. The avocado added a nice rich creaminess to the tacos, but not much flavor. Definitely add some of the pear guac to these tacos to help cut the heat. That chipotle sauce is spicier than you think, but still be aware what you are ordering. After going through all of the choices, my friend and I had a hard time deciding on our final taco order. But once she heard duck, the decision was made. This day's special was a roasted pulled duck taco topped with sliced radish, an onion chutney, and hoisin sauce. Once again, the tacos were served on corn tortillas. This taco reminded me of a pecking duck or even a bao. The only difference was the taco shell instead of the white asian bun. The chutney had a wonderful sweetness, but didn't distract from the taco taste. The meat was extremely tender. Without question the best dish of the night. Hopefully any other day's special is as good as this one. - Make reservations. This place gets extremely packed at all times of the week and night. We went on a random Monday night... somehow the entire restaurant was packed at 8PM. - Definitely share. Each order comes with 4 smaller tacos, making it a perfect dish to share. - Service can be kind of slow and tables really jam packed together. Don't expect a fast or quiet dinner at this restaurant. 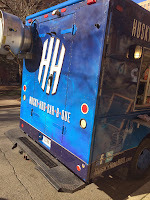 While walking across campus to grab a quick bite to eat at the student center, I stumbled across this blue food truck parked just a few feet away. I decided to check out their menu and noticed it was BBQ. I was pretty excited until I noticed the prices. 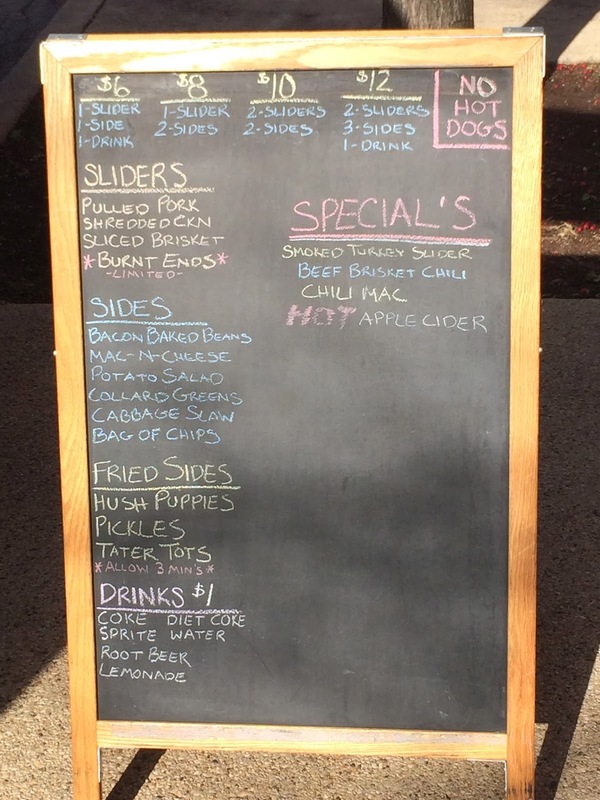 This food truck features BBQ sliders (meaning very small sandwiches... small enough that the owner told me I would need at least two and a side to be somewhat full). The food itself was tasty for sure, but not worth the cost. The people on board were all friendly and the service was real quick. 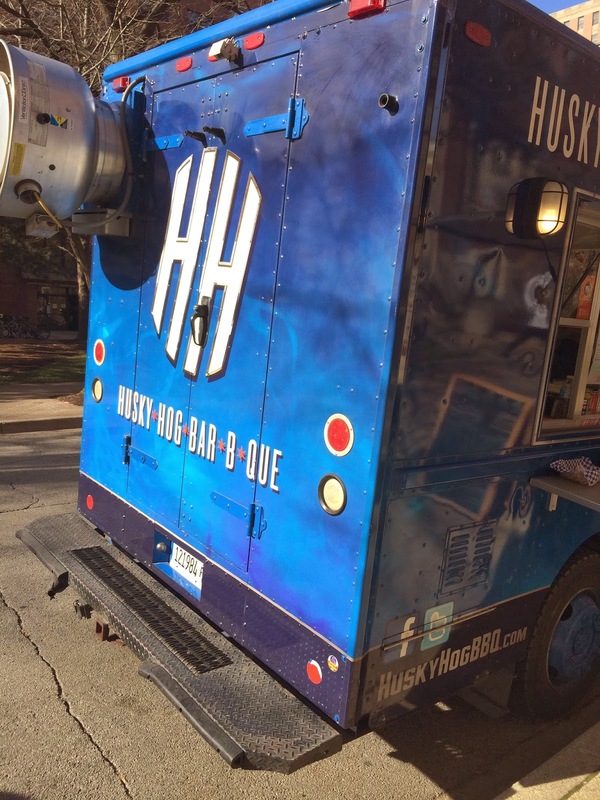 If I want good BBQ, I know I shouldn't go to a new food truck in Chicago. And, for that reason, an average rating of 3-miles was awarded. For my meal, I stuck with the $10 box... pretty expensive for lunch. Anyway, it came with my choice of two sliders (I chose the pulled pork slider and the burnt ends slider), a side of Mac n' Cheese, their bacon baked beans, and the guys were generous enough to throw in some corn bread. The sandwiches were served on sweet slider buns and topped with something unique. For the pulled pork, it was a pickle, and for the burnt ends, they used pickled red onions. Both sandwiches were pretty tasty, just extremely small for your money. The mac n' cheese didn't really have a specific cheese flavor, but it did have one of the best crusts I have had. It was extremely crispy (It was obviously sprinkled on before serving). And those beans... he told me it was the 2nd most popular, and I don't see how it could be. The red onions over power everything... Add some of the meat into the beans and extra BBQ sauce and it tastes a little better. - Combos are definitely the best deal... but that isn't saying much. 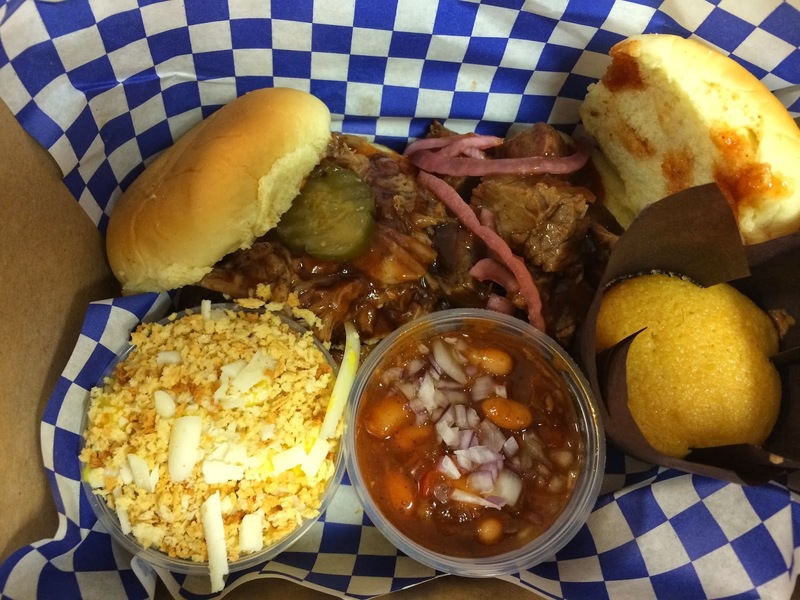 If you are really craving BBQ and can't find other places, then this is an OK place to settle. - Ask them to not pre-sauce the food. This way you can add whichever BBQ you prefer. - Don't expect to get full. I sure wasn't and I already splurged for the $10 box. Cocktail bars and craft beer bars continue to expand in the Chicago area. Somehow, I kept forgetting to post about Barrelhouse Flat, possibly my favorite bar in Chicago. This bar located in Lincoln Park offers dozens of cocktails (in fact, they have a menu with over 6 pages full of cocktails). From your typical whiskey stirred drinks to those creative egg white infused cocktails, there is something for everyone. The feel of the bar is a speakeasy/lounge type. Downstairs is a huge bar displaying the variety of whiskeys, liquors, and other mix-ins. If you get lucky, the upstairs has more of that lounge feel to it. I definitely love this bar and I think their drinks rival some of the better bars in New Orleans (home of drinks like the Sazerac). And for that reason, I decided to give them a 5-mile rating because I would definitely work the 5-miles for these drinks. 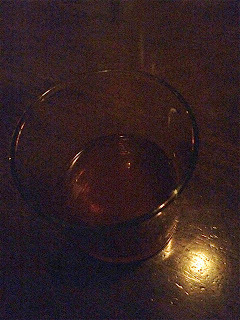 Having spent a month in New Orleans until just a few weeks ago, I was hoping for a place that served up a great sazerac. I had been here before, but forgot about their cocktail list. In their sazerac, they use a very common recipe consisting of rye whiskey, a simple syrup, bitters, and of course, some form of absinthe. I was surprised not to find a swirl of lemon peel garnishing the glass. Anyway, it was made perfectly. Great aroma from the absinthe and of course the use of a good rye whiskey. Still love this place. After a couple sazeracs, I decided to switch it up. An Old Fasioned is my next favorite drink. Thankfully, here, they refrain from using cherries (which I just don't enjoy). They use a bourbon whiskey, syrup, orange, and bitters. Another strong, yet tasty drink. The orange actually stood out, especially if you smash up the peel just a little. For my last drink, I figured why not order a different whiskey drink. I kept with the same stirred theme when I decided on the Manhattan. This drink is made with a rye whiskey, sweet and dry vermouth, and of course... bitters. No surprise there. Honestly, I don't remember this drink too much, but if you enjoy whiskey drinks like a sazerac, this is another great option. - Immediately put your name down for the lounge seating. It can be up to a 2 hour wait, but well worth it to go upstairs! - Tables and bar seating on the first floor are all FIRST COME, FIRST SERVE. So if you see someone leaving, stalk that table. - No driving here... parking is difficult and why would you not want to take advantage of their huge cocktail list. How far would I walk for these drinks? After having my car washed at the Logan Square Car Wash, I figured it was time to explore the area just a little more. Driving around, I found La Boulangerie just about a block or two down the road. I had heard about this French-inspired bakery in the past, but somehow it slipped my mind to ever come out and try it. Upon walking in, you find plenty of small tables for dining in, as well as a beautiful display case filled with colorful pastries. A smell of fresh crepes fills the air, which pairs nicely with the scent of brewing coffee. I believe they are known for the macarons, which in my opinion, were just average. They had some great ones, but also had ones I never want to eat again. Their other pastries are also rich and wonderful for dessert, but you are definitely paying for that French-style cuisine. Personally, I wasn't that impressed, but my friends definitely loved the desserts. I think a 3.5 mile rating is good. Macarons are one of my favorite desserts or snacks available at bakeries. I would always skip the croissants or the freshly baked bread or fine sandwiches in Paris bakeries just to have room for a macaron or two. Here, they have many flavors that rotate seasonally. Their current flavors are--from left to right--carrot cake (orange), hazelnut (brown filling), cherry (red), pistachio (green), caramel (light tan), passion fruit (yellow), and chocolate (cookies n cream-like). I wasn't a big fan of several of the macaroons, including the pistachio and chocolate. But the more exotic flavors like passion fruit and carrot cake where on point. They completely fooled my taste buds because I truly thought I was biting into a slice of carrot cake. These definitely aren't as high quality as Paris macarons or even Hendrickx Belgium Bread Crafter (located in downtown Chicago), but they do fulfill your macaron cravings! After seeing this chocolate tart and finding out it was basically a Snicker bar, I had to order one. It was a chocolate tart filled with peanuts and caramel. This tasted exactly like a Snicker, just looked much more presentable. The caramel was still in that gooey phase despite being in the fridge for a few hours. Definitely worth trying! Before leaving the bakery, I needed to sink my teeth into one of their pastries. I choose the coffee eclair. This light flakey dough pastry is filled with a coffee cream before being covered in a coffee-sugary glaze. The eclair was definitely on the richer side and surprisingly very sweet for having a coffee quality to it. It was also a little pricier at three bucks a pop. With just a little space remaining in the box, I decided to order one more pastry. I went with the burnt sugar cream puff. This cream puff was topped with a thick disk of burnt sugar before being chilled. This pastry saved my review on La Boulangerie because I truly enjoyed eating every bite of it. The cream puff was light and airy with a vanilla bean cream filling. The puff was filled to max capacity with the cream before that sugary treat was placed on top. The burnt sugar gave a little smokey flavor without overwhelming the vanilla. It was just sweet enough to satisfy a sweet tooth, but not make you nauseous. I could eat a dozen of these if it wasn't for the $2.50 price tag. - Remember that this place also serves Crepes. I haven't had any, but will definitely try them out next time. - Plenty of street parking! - Don't order all of the macarons. Some of the flavors are just not that great. I suggest just ordering one or two that you really want to try. And just because they are seasonal, doesn't mean they are tasty.